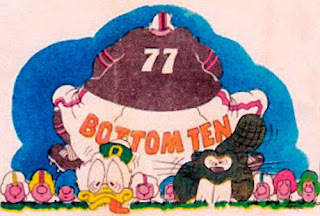 harveysbottomten: Bottom Ten: It doesn't get any worse than this! Colorado has had a rough time adapting to its new conference, the Pac-11 1/2. First, there were the hard feelings over the NCAA's ruling that the vanishing Buffaloes constitute only half a team. Then there were the game results, the latest of which was the 6-50 loss to USC. If the season were to end today, the Buffaloes would face Auburning (1-6) in the Bowl Chump Series (BCS), assuming that a sponsor can be found..
Sites bidding for the honor reportedly include Flushing Meadows, N.Y.; the Bonneville Salt Flats; and the famed Irwindale Gravel Pit (a former bidder for the Raiders). In the event that none of the three work out, a Bottom Ten spokesman said the game could be played at any high school in the nation that wasn't using its field that day. 11. South Florida (2-5); 12. Washington State (2-6); 13. Wyoming (1-6); 14. Tulane (1-6); 15. South Florida (2-5); 16. Akron (1-7); 17. New Mexico State (1-6); 18. Studying abroad this semester; 19. Central Michigan (2-5); 20. Electoral College (0-0). Rout of the Century (well, it is only 2012): Oregon (7-0) vs. Colorado (1-6). Crummy Game of the Weak: Ill (2-5) vs. Indiana (2-5). Kansas City's streak could come to an end this week because it's playing Oakland (2-4). Then again, the Chefs are starting QB Brady Quinn. The Chefs have benched Matt Cassel in what has been a subpar year for ex-USC signal-callers. The teams quarerbacked by Cassel, Mark Sanchez (Jets) and Carson Palmer and Matt Leinart have a combined 6-13 record. Elsewhere, the NFL, so shocked that San Diego has only lost three games, has accused the team of using an illegal substance. Coach Norv Turner, speaking on behalf of every Charger employee, said: "Nobody in this organization has used Stickum." Oh, yeah? Well then how else could Turner have stuck with San Diego this long? 6. Oakland (2-4); 7. Cleveland (1-6); 8. N.J. Jets (3-4); Grampa Bay (2-4); 10. San Diego (3-3). Crummy Game of the Week: Oakland (2-4) vs. Kansas City (1-5). Quotebook: "Ndamukong Suh is this close to pulling people's heads off," said talk show host Colin Cowherd after Suh body-slammed Bears QB Jay Cutler to the ground.